Cristina is a working artist & art educator, based in Greater Boston. She has developed her photographic skills in 20 years of practice, including photographing more than 700 weddings, portraits and events. She is a graduate of the School of The Museum of Fine Arts (Boston, MA), New England School of Photography (Boston, MA), and the College of William and Mary (Williamsburg, Virginia). Her personal work encompasses photography, paper arts including bookmaking & paper marbling, printmaking, soapmaking and a line of specialty holiday canned goods developed from her own recipes. 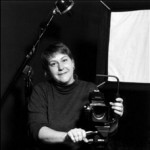 Cristina’s teaching experience includes being an art educator and career consultant at New England School of Photography, faculty & artist-in-residence at both the Attleboro Arts Museum & the Fuller Craft Museum, faculty at The Eliot School, the New Arts Center and the Cambridge Center For Adult Education, as well as private instruction. Cristina has produced numerous bodies of photographic work, fine art prints & artist’s books exhibited and sold throughout the United States. For more information on Cristina Hajosy's other work, her current classes, shedule and private instruction visit HajosyArts.com.